Storycraft got me really excited about my writing. What higher praise could I give? It is a practical book filled with examples, written for an audience of journalists who are experienced at producing true stories about real people and events, for publication, usually on tight deadlines. This isn’t writing to find out what you think, or writing to learn a la William Zinsser. This is effectively using the tools of the writing trade to write better, faster. The book starts with cogent advice on structure that could save you weeks of work repairing bad drafts, and returns to go deeper on structure after a tour of basic components like point of view, voice, scene, character, action, and dialogue. I particularly appreciated Hart’s parsing of narrative nonfiction into several specific forms: reporting, story narratives, explanatory narratives, and “other.” That last category contains vignettes, tick-tocks, bookend narratives, personal essays that “take an idea for a walk”, and issue essays like Michael Pollan’s New York Times Magazine article “An Animal’s Place” that grew into The Omnivore’s Dilemma. It didn’t hurt that Hart frequently referenced my favorite writing instructor Jon Franklin, author of Writing for Story. If you’ve ever heard me talk about the complication, three developments, and a resolution–that’s Franklin’s infallible advice on structure. The fact that the book is written for journalists means it reads a little differently than the many “how to write your memoir” books I’ve collected. 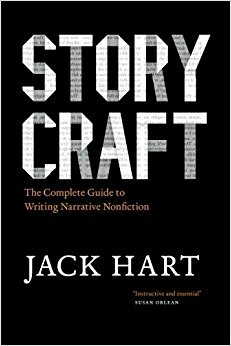 Many in this genre offer writing craft tips in the same vein, but Storycraft is to those what a master class is to a weekend workshop. The topic list is the same, but the instruction goes much deeper. At the same time I was chowing down Storycraft I was drafting a 4000-word sample essay about my MFA project, a company history of Glory Foods drawn from interviews with one of the founding partners. I literally felt my brain expanding as I swallowed chapters whole, then immediately tried to apply what I was learning to what I was writing. Each draft grew stronger under Jack Hart’s specific, practical advice. Would you benefit from reading this book? That depends on your intentions for your writing. If you have one life story you plan to tell, for an audience of family and friends, there are easier little how-to-write-memoir books I’d point you to. The Memoir Project by Marion Roach Smith is one of my favorites, (reviewed on Trues Stories Well Told back in 2011). But if, like me, you want to deepen and clarify what you know, to learn terminology for things you’ve sensed but never been able to put into words,to take your nonfiction writing to a new level, to boy oh boy is this a great guide!